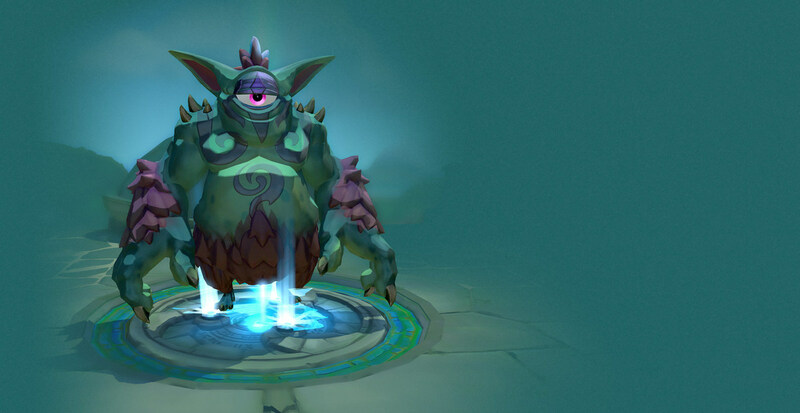 In this guide we provide an overview of Gigantic and its play systems, including the newly added Power Orbs. 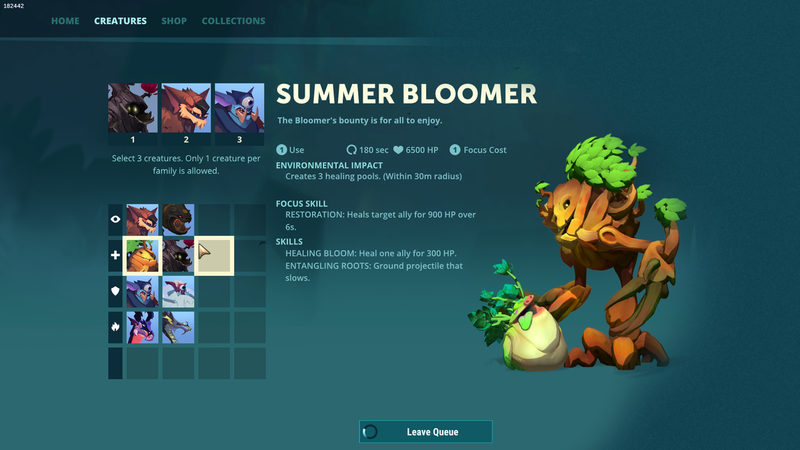 Gigantic can be confusing because it’s unique and like any game in Beta, goes through periods of change. At its heart, it’s a surprisingly simple game but while Motiga update their tutorial to reflect the latest changes to the game. It may sound simple but having heard from many players unsure of the very basics, you and your team need to defeat the enemy. You do this by killing their Guardian, while defending your own throughout the course of a match. Gigantic revolves around a resource called Power. It can be obtained from multiple sources and is pivotal in your team's attempts at killing the enemy Guardian. Without Power and failing to secure it, you will never win a match. House Aurion has achieved maximum Power, indicated by the yellow bar, and its Guardian will now rampage across the map to the enemy Guardian. 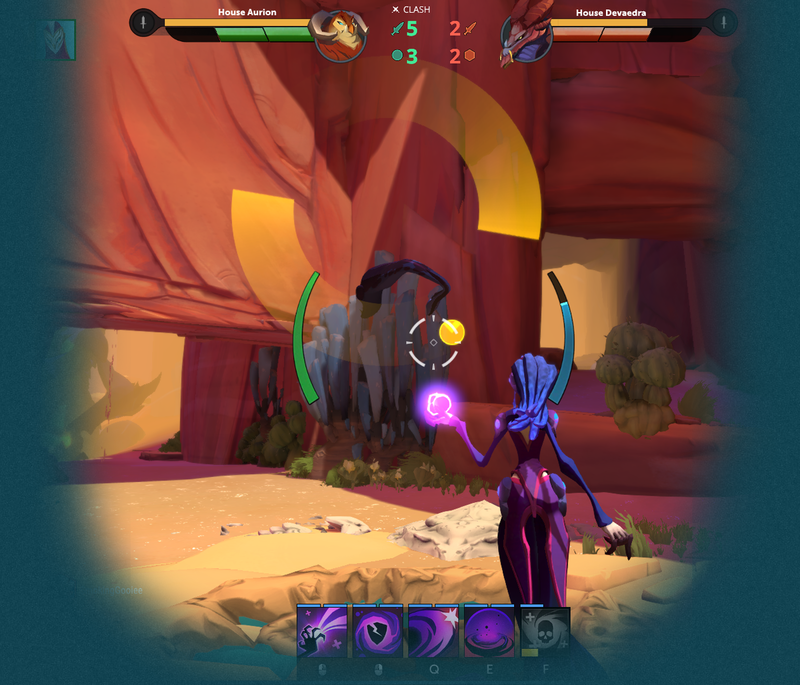 A key part of Gigantic is fighting enemy players. Killing a player will reward your team with a small amount of Power. It’s in your team's best interests to fight the enemy and kill them but also ensure you preserve your own life. Dying unnecessarily, without securing kills, will provide the enemy team with Power and eventually lead to their Guardian attacking your own. Similarly to killing enemy players, killing creatures is incredibly important for gaining Power. Creatures by themselves do not generate Power and instead act as a means of collecting it, when a Power Orb appears (we’ll discuss these below). By killing enemy creatures you not only secure Power for your team, but prevent the enemy from easily collecting theirs. Tip: Dying in Gigantic resets the respawn timer for all those who have already died. If you know your team is waiting to respawn, back off and let them arrive from your airship. Don’t let them wait longer by dying unnecessarily. The rotating yellow symbol indicates a Power Orb will spawn shortly. If you have no creature, be ready to collect it when it appears. The pattern would then repeat over the course of a match. This allows players to predict when a Power Orb will appear and if they have no Creature on that Control Point, ensure they’re then at the location to collect it. Where collecting a Power Orb is concerned, it takes several seconds for a Power Orb to eventually appear once it begins to summon. If you have a Creature on the point where it will summon, they will collect it automatically. If you don’t, you and your team should ensure you’re there to collect it by standing on it - it takes 6 seconds to collect an orb. Players should also note that even with a Creature on a Control Point, the enemy can still steal your Power Orb. By attacking your Creature, they will force it off of the Control Point and they’re then free to take the Power Orb from you. Protect your Creatures when an Orb is arriving and if the Creature is under attack! Tip: Tripp or Tyto make exceptional back-cappers as they can stealth or quickly travel to the enemy's base to distract Creatures and steal their Power Orb. Doing this not only stretches the enemy team, but provides big Power Gains. If the enemy has a Tripp or Tyto, make sure they don’t do this! Each Guardian has two Power Gems with one attached to each hand. These Power Gems, indicated by two glowing crystals, can be attacked and broken. Once broken, they provide your team and Guardian a large dose of Power. It's certainly viable, at this stage, to break Power Gems early by sending an assassin into the enemies base to attack the Power Gems. In addition, attacking them when the enemy Guardian rampages, so that you can secure shielding for your Guardian, is also very important. Tip: Power Gems take significantly reduced damage from ranged attacks, meaning if you do want to damage them as a ranged Hero, you'll need to get up close and personal. Each Creature begins life as a “baby” and can be upgraded using your Focus ability to an adult. Some Creatures cost different amounts of Focus to upgrade and this reflects their strength or utility. In addition, all Creatures must be summoned and they require you to stand on a Control Point, and channel them. Once summoned, they have a “build” time and once it’s complete, they will appear in the game world and be able to collect Power Orbs or help you when you’re nearby. Tip: Standing near summoning Creatures builds them quicker. For an adult Creature, try to have as many of your team as possible stand next to it so it completes as soon as possible. Where upgrading Creatures is concerned and to use one example, a baby Bloomer heals you and all your team around it for a small amount. An adult Bloomer, such as the Autumn version not only heals for significantly morebut also provides Healing Pools that players can walk into and collect an invisibility power-up. Although adult Creatures provide the same Power gain as baby Creatures, their real strength lies in the fact they’re tough to kill and cannot be pulled off point easily (and so prevent Power Orbs being stolen). Tip: If you begin summoning or upgrading a Creature and begin fighting the enemy near it, its summon/upgrade timer will be halted. Kill the enemy quickly and defend your Creature so it can complete. It is incredibly important that you and your team save your Focus skills and spend them on upgrading Creatures as early as possible. Not only will this prevent enemy players from easily stealing your Power Orbs but it also means that should you need to retreat to a Control Point, you have an adult Creature there to help you. Adult Creatures hurt - ensuring you have as many as possible going into The Clash is imperative. Tip: Always upgrade your creatures back to front. Upgrading a Creature on a Control Point that's near to the enemy is very risky. Upgrading those near your Guardian first is much safer. Finally and I can’t emphasize this enough: only summon Creatures on Control Points that you can protect and specifically, in your own “territory”. Summoning Creatures outside of your territory, though possible, is risky because their build time is increased by 100% and if they die, you will give your enemy Power. Tip: Many adult Creatures are very difficult to solo kill. Storm Drake’s are deadly and require 3 Focus to summon. There’s a reason for this: they hurt and will easily protect your Power Orbs - getting one is a good aim to have for your team. 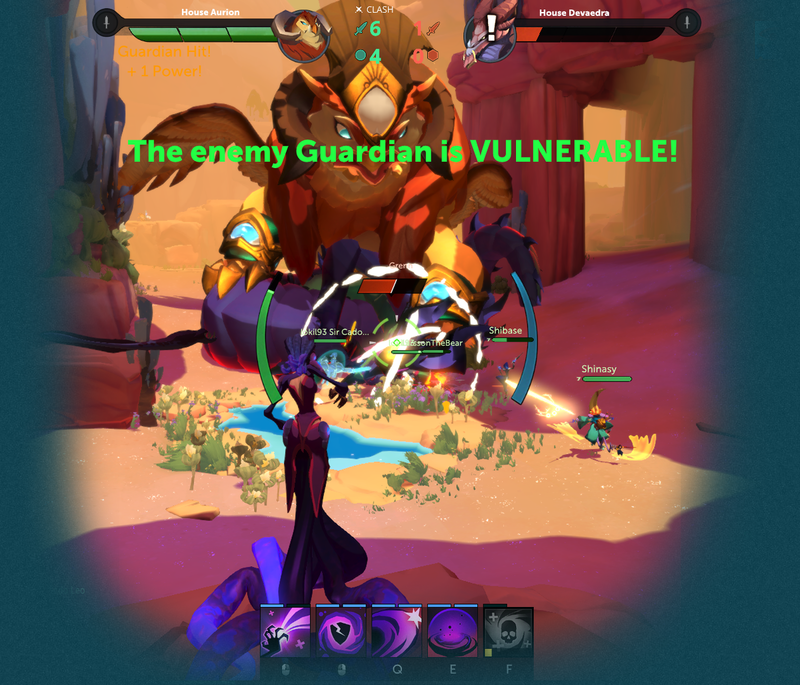 Wounding the enemy Guardian is key to winning a match in Gigantic. Securing a Wound is the only time you’ll be able to physically harm their health bar and as a result, it’s imperative you secure them when the opportunity arises. A Guardian’s health is split into three and when you secure a rampage (by powering up your Guardian to full strength) the enemy Guardian will remain vulnerable until the rampage timer runs out (roughly around 30 seconds). During a rampage your team will gain a speed boost so you can quickly make your way to the enemy Guardian to attack its heart. Once you’ve depleted a third of its health, the enemy Guardian will rally and get back on its feet. You will then need to retreat and power your Guardian once again, repeating the process until The Clash. House Devedra are vulnerable to being Wounded and are currently under attack by the enemy team. If they deplete the health bar, House Aurion will win. Failing to secure a full Wound - known as Partial Wounds - will result in your team having to secure another rampage. Tip: When your Guardian rampages and attacks the enemy Guardian, it will deal some damage. Should the enemy Guardian only have a slither of health left as a result of you failing to previously secure a Full Wound, it will result in an “Auto Wound” where your Guardian once it does attack, removes the remaining slice. In this instance, there’s no need to travel to the enemy Guardian. I cannot stress this enough: if your team secures a rampage by powering your Guardian, go for the Wound. All of you should position yourself so that when you receive the speed boost, you can move alongside your Guardian so that you’re then able to attack the Wound. Will the enemy team try to protect their Guardian? Yes. Will some of you die at the enemy Guardian? Yes. Regardless, it is absolutely worth it, even if it means you all die in the process. By the time the enemy team makes its way into your territory, you or your team will have respawned ready to defend. House Aurion has managed to secure enough Power (indicated by the blue bar), during House Devaedra's rampage, that they have a full shield. This significantly improves their chances of defending a Wound. During a rampage you and your team have an opportunity to protect your Guardian by giving it a shield. You can do this in the same way you would gather Power (see above) with any Power collected, converted directly into shielding. Should you collect enough Power from all available sources, your Guardian will gain a full Shield. When your Guardian has a full Shield, regardless of whether it’s vulnerable to being Wounded, the enemy team will have a very difficult job at reducing its health and more often than not, will result in a Partial Wound - this is a very good thing and securing as much shielding as possible should be a priority when the enemy begins to rampage. Tip: When the enemy Guardian rampages, it will stand at the halfway point on the map for several seconds. Use this time to attack its Power Gems and if you break both, it’ll provide your team with a huge boost in your Guardian’s shielding. The Clash is triggered by your team securing 2 Full Wounds or both teams having triggered 8 rampages. At the top of the screen you’ll see a row of small white boxes. These denote Full or Partial Wounds. If your team successfully secures 2 Full Wounds, regardless of match length, the Clash will begin. During the Clash, an area of the map that was previously inaccessible will become available or the fight, including your Guardians and Creatures, will make their way to a set location (such as Canyon). As a smaller area, fights are not only more frantic but much closer together. The exact same principals apply as before, there’s just greater risk upon death as the small fighting space means the enemy has very short travel time between their territory and yours and if your team dies, they can quickly capitalize by killing your adult creatures, or Wounding your Guardian. Tip: If you wipe the enemy team, or several of them, quickly make your way to their adult Creature’s and kill them. This provides you Power, prevents their Power Orbs automatically being collected and leaves them open to Power stealing.